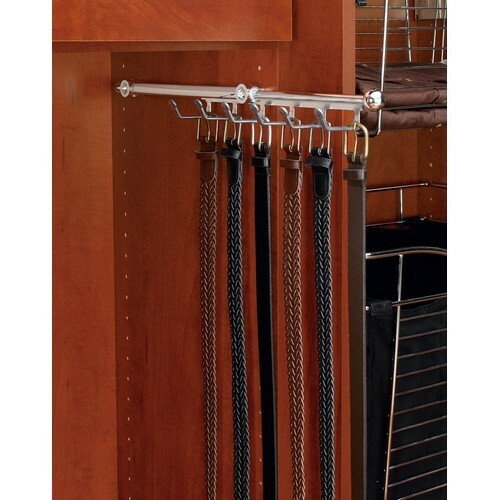 Rev-A-Shelf's pullout Belt/Scarf Organizers features 5 or 6 hooks. They have a fully accessible 8-3/16" (6-3/4" for 12" depth) telescoping rod with clear non-slip soft PVC coated hooks. 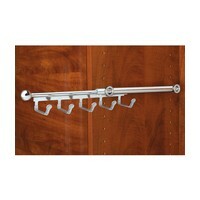 They are available in Chrome, Satin Nickel and Oil Rubbed Bronze and are designed for 12" and 14" depth closet panels. They feature adjustable mounting brackets for mounting capabilities in various system hole applications and install easily with two Euro screws.